Review: L.A. private detective Philip Marlowe is hired by a rich family. He has been given a really complicated case but even before it is all over he has seen murders, pornographers, nightclub rogues and also what might be love. This is adapted from a novel by Raymond Chandler. The director bought the rights to the book for $20,000 then sold them to the studio for $55,000. This is the second screen pairing of real-life lovers Humphrey Bogart and Lauren Bacall. This has got to be one of the high-water marks of Hollywood’s love affair. Howard Hawks did not approve of this relationship. 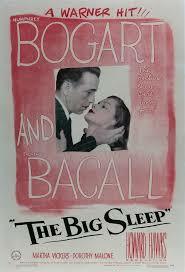 The original release date was delayed to give Howard Hawks time to exploit and build up the Bogart and Bacall scenes. Lauren Bacall does all her own singing and is not dubbed like most people think. The pace never lets up in all the 2 hours. This remains one of the greatest film noirs ever made although at the time many critics thought the plot was too complicated. The two main themes that occur in this are the cynicism of the 1930s America and also the corruption of American Society. At the beginning of 2012 the late film critic Barry Norman produced a list in the Radio Times of the 100 greatest films of all time and this was listed.